​OUR MISSION is to reduce the incidence of heritable diseases in the Doberman by studying and addressing the depression in the overall genetic diversity of the Doberman breed and studying and researching widespread disease-associated mutations, through comprehensive genetic testing and analysis, development and sharing of evidence-based breeding findings, development of online breeder decision-making tools, and long-term tracking of results to measure the effectiveness of varied approaches to breeding -- in terms of genetic health and longevity. 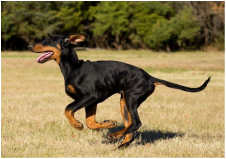 ​The non-profit Doberman Diversity Project is dedicated to lowering the price barrier to thorough genetic testing of Dobermans. For $149, Breeder can now get test results that include GENETIC DIVERSITY (genetic COI, diversity, rare genetics and genetic compatibility, and GENETIC DISEASE (vWD1, PDK4, DM, MDR1, and GPT) and TRAIT (coat colors like black, brown and dilute, and more) . 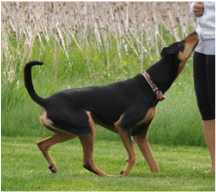 The Doberman Diversity Project aims to turn complex genetic data from tested dogs and turn it into easy-to-understand, user-friendly breeding tools. These tools will allow Breeders to evaluate the genetic diversity of potential breeding combinations before actually mating two dogs. We will collect health data (including date of death and cause of death) to compare genetic health and longevity outcomes in litters bred with differing approaches (e.g., focus on Litter COI and other genetic factors). Will breeding for diversity make a positive difference, create unanticipated issues, or make no difference in health and longevity? Our goal is find out. Using high-resolution genome mapping studies, this new study will evaluate 1,000 Dobermans worldwide in an effort to identify specific areas of the Doberman genome that are associated with a breed-specific disease. This is a rare opportunity for the breed to take an extremely close look at which genes are the culprits to complex diseases. Our goal is provide access to all of these advanced resources FREE. ​No paid membership, annual fee, or per use fees. Do you support open access education and Doberman health? Get in touch with us to get on our Donor List. Then, hang on! We are actively working to make contributions from all 50 States legal and tax-deductible. If you would like to be added to our Donors list, please click here. For more on our non-profit...Click here!